We lead with the two most exciting pieces of news. First, CAIDA celebrated its 20th anniversary this year! Perhaps no one, least of all us, thought we could keep it going this long, but each year seems to get better! Second, CAIDA director kc experienced the greatest honor of her career this year when she received the Internet Society’s Postel Service Award! On to this year’s annual report, which summarizes CAIDA’s activities for 2017, in the areas of research, infrastructure, data collection and analysis. Our research projects span Internet topology mapping, security and stability measurement studies (of outages, interconnection performance, and configuration vulnerabilities), economics, future Internet architectures, and policy. Our infrastructure, software development, and data sharing activities support measurement-based internet research, both at CAIDA and around the world, with focus on the health and integrity of the global Internet ecosystem. Internet Performance Measurement. This year we leveraged our years of investment in topology measurement and analytic techniques to advance research on performance, reliability, resilience, security, and economic weaknesses of critical Internet infrastructure. We continued our study of interconnection congestion, which requires maintaining significant software, hardware, and data processing infrastructure for years to observe, calibrate and analyze trends. We also undertook several research efforts in how to identify and characterize different types of congestion and associated effects on quality of experience using a variety of our own and other (e.g., M-Lab) data. Monitoring Global Internet Security and Stability. Our research accomplishments in Internet security and stability monitoring in 2017 included: (1) characterizing the Denial-of-Service ecosystems, and attempts to mitigate DoS attacks via BGP blackholing; (2) continued support for the Spoofer project, including supporting the existing Spoofer measurement platform as well as developing and applying new methods to expand visibility of compliance with source address validation best practices; (3) demonstrating the continued prevalence of that long-standing TCP vulnerabilities on the global Internet; (4) new methods to identify router outages and quantify their impact on Internet resiliency; (5) a new project to quantify country-level vulnerabilities to connectivity disruptions and manipulations. Future Internet Research. We continued to engage in long-term studies of IPv6 evolution, including adaptation of IPv4 technology to IPv4 address scarcity (e.g., CGN), and detecting Carrier-Grade NAT (CGN) in U.S. ISP networks, as well as an updated longitudinal study of IPv6 deployment. We pared down our participation in the NDN project while we wait for some NSF-funded code development to complete. We hope we will be able to use this software platform to evaluate NDN’s use in secure data sharing scenarios. Economics and Policy. We undertook two studies related to the political and economic forces influencing interconnection in Africa, as well as several other studies on the economic modeling of peering that we are determined to publish in 2018. We also held a lively workshop on Internet economics where we continued the discussion on what a future Internet regulatory framework should look like. Infrastructure Operations. We continued to operate active and passive measurement infrastructure with visibility into global Internet behavior, and associated software tools that facilitate network research and security vulnerability analysis for the community. We also maintained data analytics platforms for Internet Outage Detection and Analysis (IODA) and BGP data analytics (BGPStream). We are excited about a new project we started late in 2017 (PANDA) to support integration of several of our existing measurement and data analytics platforms. Outreach. As always, we engaged in a variety of outreach activities, including maintaining web sites, posting blog entries, publishing 14 peer-reviewed papers, 2 technical reports, 2 workshop reports, making 31 presentations, and organizing 5 workshops (and hositng 4 of them). We also received several honors from the community: an IRTF Applied Networking Research Prize for our BGPStream work in March, and kc received the Postel Service Award in November! This report summarizes the status of our activities; details about our research are available in papers, presentations, our blog, and interactive resources on our web sites. We also provide listings and links to software tools and data sets shared, and statistics reflecting their usage. Finally, we offer a “CAIDA in numbers” section: statistics on our performance, financial reporting, and supporting resources, including visiting scholars and students, and all funding sources. Getting the next decade off to a hopefully auspicious start, CAIDA’s new program plan for 2018-2022 is available at www.caida.org/home/about/progplan/progplan2018/. Please feel free to send comments or questions to info at caida dot org. As the Internet and our dependence on it have grown, the structure and dynamics of the network, and how it relates to the political economy in which it is embedded, have gathered increasing attention by researchers, operators and policy makers. All of these stakeholders bring questions that they lack the capability to answer themselves. Epistemological challenges lie in developing and deploying measurement instrumentation and protocols, expertise required to soundly interpret and use complex data, lack of tools to synthesize different sources of data to reveal insights, data management cost and complexity, and privacy issues. Although a few interdisciplinary projects have succeeded, the current mode of collaboration simply does not scale to the exploding interest in scientific study of the Internet, nor to complex and visionary scientific uses of CAIDA’s data by non-networking experts. We believe the community needs a new shared cyberinfrastructure resource that integrates active Internet measurement capabilities, multi-terabyte data archives, live data streams, heavily curated topology data sets revealing coverage and business relationships, and traffic measurements. Such a resource would enable a broad set of researchers to pursure new scientific directions, experiments, and data products that promote valid interpretations of data and derived inferences. I had the honor and pleasure of participating in a fantastic PI meeting last month — the National Science Foundation’s Future Internet Architecture (FIA) research program, 20-21 September 2014. As the formal FIA program winds down, NSF wants to maximize the opportunities for return on its investments into this program by helping connect principal investigators and researchers with other potential applied research and development funding sources. We are all well aware that, at least in the case of the NDN project (in which CAIDA participates), there are still huge open research challenges that will require years to conquer. But there are also tremendous opportunities to apply the ideas (and the code base) at this stage of the project’s evolution. Much credit goes to John Wroclawski and Craig Partridge, who led the organization of this meeting. They arranged short presentations by seven federal agency representatives who outlined strategic interests of their agencies that were relevant to FIA technologies, and how to effectively engage those agencies: Stu Wagner (DARPA/I2O), Joe Evans (DARPA/STO), Mark Laurri (DARPA/MTO), Rich Carlson (DOE SC-ACSR), Dan Massey (DHS S&T), Kevin Thompson (NSF), and Doug Montgomery (NIST). They each provided a view of what their programs are, guidelines for how to propose ideas to their agency, links to recent funding opportunities, and answers to any questions we had. This firehose-of-information session was followed by lunch and then breakouts to prepare pitches to friendly external respondents for feedback and discussion. Each respondent brought broad experience with non-NSF government funding across agencies and technical areas. The FIA researchers got some priceless preparation from some of the best and brightest in the federal funding community. The next challenge for FIA PIs is to convince some of them to participate in the next round of investment into FIA research ideas and technologies. Kudos to NSF and to John and Craig for great assistance with this goal. CRA Congressional visit to Washington D.C.
Internet-specific topics I discussed included the importance of scientific measurement infrastructure to support empirical network and security research, broadband policy, and Internet governance. 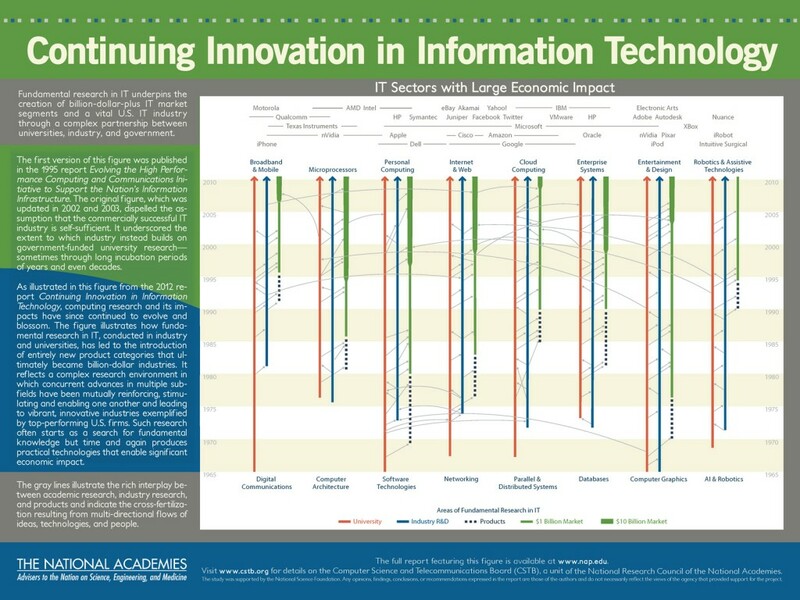 We left them with a terrific infographic from the National Academy study “Continuing Innovation in Information Technology“, which shows the economic impact of different areas of fundamental IT research. The 2-pager flyer and the whole National Academy report, Depicting Innovation in Information Technology, is available on the National Academies of Science, Engineering, and Medicine Computer Science Telecommunications Board (CSTB) site. Kudos to the Computing Research Association for providing a wonderful opportunity to engage with policy folks. Mapping the Internet. We continued to pursue Internet cartography, improving our IPv4 and IPv6 topology mapping capabilities using our expanding and extensible Ark measurement infrastructure. We improved the accuracy and sophistication of our topology annotation capabilities, including classification of ISPs and their business relationships. Using our evolving IP address alias resolution measurement system, we collected curated, and released another Internet Topology Data Kit (ITDK). Mapping Interconnection Connectivity and Congestion. We used the Ark infrastructure to support an ambitious collaboration with MIT to map the rich mesh of interconnection in the Internet, with a focus on congestion induced by evolving peering and traffic management practices of CDNs and access ISPs, including methods to detect and localize the congestion to specific points in networks. We undertook several studies to pursue different dimensions of this challenge: identification of interconnection borders from comprehensive measurements of the global Internet topology; identification of the actual physical location (facility) of an interconnection in specific circumstances; and mapping observed evidence of congestion at points of interconnection. We continued producing other related data collection and analysis to enable evaluation of these measurements in the larger context of the evolving ecosystem: quantifying a given ISP’s global routing footprint; classification of autonomous systems (ASes) according to business type; and mapping ASes to their owning organizations. In parallel, we examined the peering ecosystem from an economic perspective, exploring fundamental weaknesses and systemic problems of the currently deployed economic framework of Internet interconnection that will continue to cause peering disputes between ASes. Monitoring Global Internet Security and Stability. We conduct other global monitoring projects, which focus on security and stability aspects of the global Internet: traffic interception events (hijacks), macroscopic outages, and network filtering of spoofed packets. Each of these projects leverages the existing Ark infrastructure, but each has also required the development of new measurement and data aggregation and analysis tools and infrastructure, now at various stages of development. We were tremendously excited to finally finish and release BGPstream, a software framework for processing large amounts of historical and live BGP measurement data. BGPstream serves as one of several data analysis components of our outage-detection monitoring infrastructure, a prototype of which was operating at the end of the year. We published four other papers that either use or leverage the results of internet scanning and other unsolicited traffic to infer macroscopic properties of the Internet. Future Internet Architectures. The current TCP/IP architecture is showing its age, and the slow uptake of its ostensible upgrade, IPv6, has inspired NSF and other research funding agencies around the world to invest in research on entirely new Internet architectures. We continue to help launch this moonshot from several angles — routing, security, testbed, management — while also pursuing and publishing results of six empirical studies of IPv6 deployment and evolution. Public Policy. Our final research thrust is public policy, an area that expanded in 2015, due to requests from policymakers for empirical research results or guidance to inform industry tussles and telecommunication policies. Most notably, the FCC and AT&T selected CAIDA to be the Independent Measurement Expert in the context of the AT&T/DirecTV merger, which turned out to be as much of a challenge as it was an honor. We also published three position papers each aimed at optimizing different public policy outcomes in the face of a rapidly evolving information and communication technology landscape. We contributed to the development of frameworks for ethical assessment of Internet measurement research methods. Our infrastructure operations activities also grew this year. We continued to operate active and passive measurement infrastructure with visibility into global Internet behavior, and associated software tools that facilitate network research and security vulnerability analysis. In addition to BGPstream, we expanded our infrastructure activities to include a client-server system for allowing measurement of compliance with BCP38 (ingress filtering best practices) across government, research, and commercial networks, and analysis of resulting data in support of compliance efforts. Our 2014 efforts to expand our data sharing efforts by making older topology and some traffic data sets public have dramatically increased use of our data, reflected in our data sharing statistics. In addition, we were happy to help launch DHS’ new IMPACT data sharing initiative toward the end of the year. Finally, as always, we engaged in a variety of tool development, and outreach activities, including maintaining web sites, publishing 27 peer-reviewed papers, 3 technical reports, 3 workshop reports, 33 presentations, 14 blog entries, and hosting 5 workshops. This report summarizes the status of our activities; details about our research are available in papers, presentations, and interactive resources on our web sites. We also provide listings and links to software tools and data sets shared, and statistics reflecting their usage. sources. Finally, we offer a “CAIDA in numbers” section: statistics on our performance, financial reporting, and supporting resources, including visiting scholars and students, and all funding sources. The Named Data Networking project recently published the NDN-NP annual report covering activities from May 2015 through April 2016.). Continued evolution the NDN Forwarding Daemon (NFD), to support application-driven experimentation with new NDN protocol features. Development of an Android version of NFD to promote NDN experimentation on mobile platforms. Implementation of a new transport protocol (InfoMax) that can intelligently filter streams of information in order to reduce transmitted data volume, while minimizing loss of information. A growing portfolio of supporting software libraries, including new APIs, transport mechanisms (Sync, information maximization), and security functionality, that leverage inherent capabilities of NDN, e.g., schematized trust, name-based access control. Demonstration of extremely scalable forwarding implementation using a billion synthetic names. instrumentation of applications on the testbed, to uses of ndnSIM and the Mini-NDN emulator environment. Continued uses of NDN in the four courses taught by principal investigators. research and experimentation around NDN. The NDN team has made tremendous progress in the last five years, and a larger community of information-centric networking research has evolved in parallel. Our progress revealed the importance of demonstrating NDN capabilities in IoT and big data environments, and highlighted the need for accessible software platform support and emulation capabilities to facilitate R\&D on both the NDN architecture and applications that leverage it. We have received a year of supplement funding to complete four tasks: 1) completing and disseminating native NDN applications and associated design patterns, 2) demonstrating NDN scalability; 3) documenting and releasing reference implementations, and 4) documenting NDN design decisions and lessons learned. The report for the 1st NDN Community Meeting (NDNcomm) is available online now. This report, “The First Named Data Networking Community Meeting (NDNcomm)“, is a brief summary of the first NDN Community Meeting held at UCLA in Los Angeles, California on September 4-5, 2014. The meeting provided a platform for the attendees from 39 institutions across seven countries to exchange their recent NDN research and development results, to debate existing and proposed functionality in security support, and to provide feedback into the NDN architecture design evolution. The workshop was supported by the National Science Foundation CNS-1457074, CNS-1345286, and CNS-1345318. We thank the NDNcomm Program Committee members for their effort of putting together an excellent program. We thank all participants for their insights and feedback at the workshop. What are the most significant realistic changes in network architecture, capacity, and connectivity by 2020? In what ways might these developments be affected, perhaps even precluded, by regulatory policy? In what ways might these developments in turn affect regulatory policy? What are the costs and benefits of these developments and their possible regulation? You are currently browsing the archives for the Future category.